I’m No Detective But… | ...in case you were wondering. Michael Millhouse, of Millhouse Signs, in Lewiston works on giving the windows at SCI Enterprises in downtown Lewiston some holiday spirit with a Christmas greeting Wednesday afternoon. 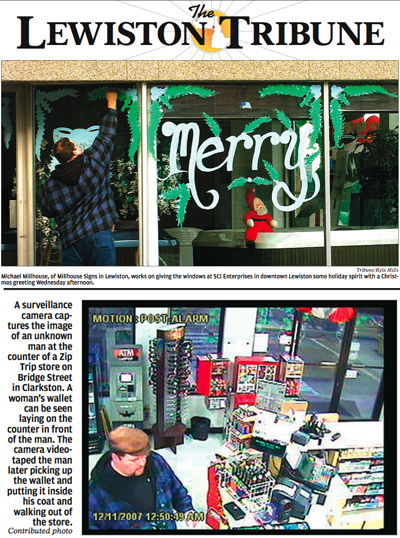 A surveillance camera captures the image of an unknown man at the counter of a Zip Trip store on Bridge Street in Clarkston. A woman’s wallet can be seen laying on the counter in front of the man. The camera video taped the man later picking the wallet up and putting it inside his coat and walking out of the store. Hmmm. If we only had another picture of him, and maybe a name, or even a company that he works at or possibly owns. Then we could catch this guy. This was actually taken from a real newspaper in Idaho, and if WordPress wasn’t being stupid I could upload the file to show you the actual front page. It looks like the zip store has some window art also. I wonder if he did theirs too? Oh Dear. I’m sure he did the windows there. Was this in the same newspaper? Like, same day and everything? Alymc…. more like the same front page on the same day… the pictures weren’t even an inch apart.